Based on 2 people sharing a one bedroom apartment. Pinhal, Laguna, Millenium, Vila Sol. Return airport transfer and free shuttle service to and from the Vilamoura courses. 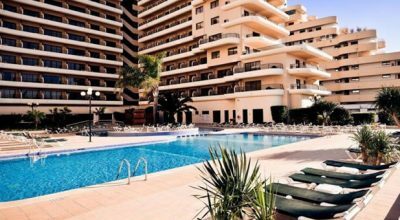 Located just a few hundred metres to the nearest beach and a couple of minutes to Vilamoura Marina, the Luna Apartment Hotel Olympus is the perfect choice for your accommodation while enjoying your golf break in Vilamoura. 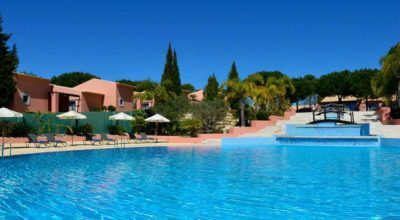 The hotel is also just 15 miles to Faro International Airport. The hotel was recently renovated and now offers 84 one and two bedroom self catering apartments which can accommodate between 2 and 4 people with an extra bed available when required. Each of the Hotel Olympus apartments offer a high level of comfort and include a balcony, air conditioning, satellite TV, telephone, radio and a kitchenette with cooking facilities. On site the hotel has many facilities such as bar, shops, beauty parlor, garden, swimming pool, tennis court, covered parking and free Wi-Fi for guests. Close by you will find a wide range of bars and restaurants with a large mix of international dishes on offer. The Vilamoura Marina is the place to be in the evening with a selection of bars, restaurants and night life available for your entertainment. If you are feeling lucky, head to the Casino for a flutter, have dinner and watch one of the many shows that are on offer. Two or four rounds of golf are included in this package at the Pinhal, Laguna, Millennium and Vila Sol courses. 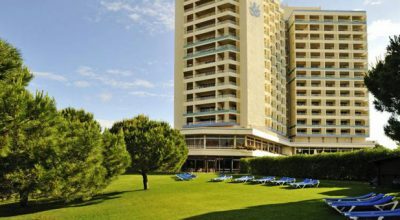 The Luna Olympus offers a high level of comfort along with the facilities to make your golf holiday in the Algarve a complete pleasure. The hotel is located just a stones throw from some great beaches as well as the popular Vilamoura Marina, which is full of bars, restaurants and great nightlife for you to enjoy! 3 night packages based on golf at Pinhal and Laguna.